Hey, if you have a gmail account you should totally follow our blog. I heard once about this guy that didn't follow our blog and a bunch of bad stuff happened to him. Don't let that happen to you! Today, in honor of Bastille Day (and the farmer's market on Sunday), we returned back to basics. 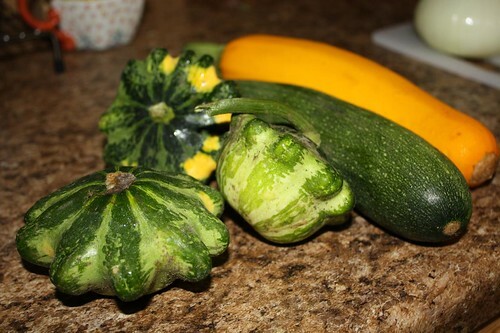 I swung by the farmer's market as it was winding down and there wasn't much left but I did pick up some good-looking zucchini as well as some kale that the woman gave me at a discount because it had been sitting out in the sun for a while and she didn't want to have to drag it back to the farm and feed to the pigs. The pigs can thank me later. I used the squash to make a makeshift ratatouille in honor of Bastille Day. Since the French apparently have no culinary tradition associated with this holiday I decided the only thing I could do was to make something French. Given that all I had in the fridge were these zucchini this was my best stab at it. It's missing a lot of the other vegetables you'd expect to see in ratatouille but this was all I had. The garlic in the fridge had given up the ghost so I simply used onion, zucchini, tomato, and herbs de Provence for this dish. 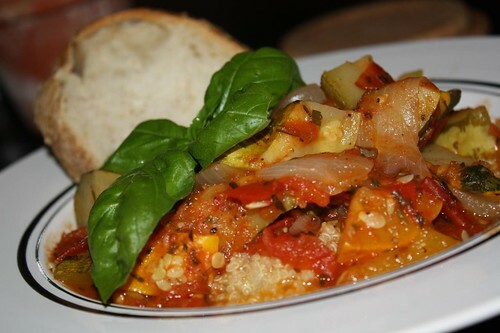 Also, I served it with delicious rosemary bread and the oh-so-traditional quinoa on the base. Everyone knows the French love them some ancient grains. We haven't had wine in a while so in honor of the French and their wine-drinking ways we decided to have a wine. While I thought it appropriate to have a wine from Ventoux (home of the famous Tour de France climb) it was a little too hot for red wine so we opted for the Michigan wine from our wine tour last summer. 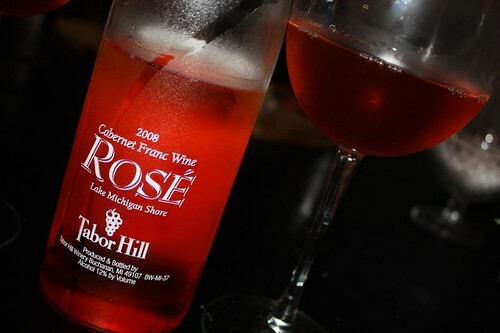 This particular rose is a Cabernet Franc from Tabor Hill. Having traveled extensively moderately somewhat in both France and Michigan you can take it on my authority that there is essentially no difference between the two places. 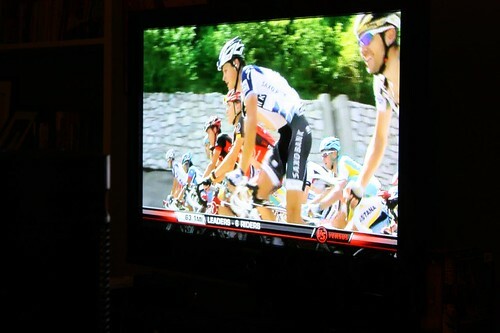 And what could be more French than watching a Portuguese man win his first stage in the Tour de France? We were also treated to the sound of muffled fireworks from the next town over as they celebrated their freedom from the oppressive French aristocracy by eating a lot of crepes. For dessert we had some more of the blueberry ice cream which, like most ice cream, seems to get better with age. Except for that terrible strawberry ice cream I made last month which was an abomination and a waste of perfectly good strawberries. With some fresh blueberries (we can't stop buying blueberries) and chocolate sauce it was fantastic. This reminds me of a time when I was young and my father took me to the ice cream parlor down the street from us. I asked for a peanut butter cup sundae with blueberry sauce and she gave my father a look as if she thought I was either insane or just an idiot. My father shrugged. When we got to the table I asked him why she'd made that face and he kindly said that he did not know. At the time I found that flavor combination to be just fine. In retrospect that girl was probably 15, and that combination was probably not that great. 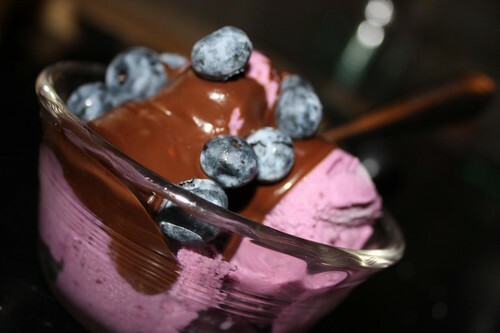 My next ice cream: blueberry and peanut butter crunch. Don't judge it until you've had it.